With a great understanding of body anatomy and proportions this aides the surgeon to be able to mimic nature. As a result, design and create natural hairlines for their patients. With skills to recognise angulation, orientation and spacing and the importance they all play. These medical and artistic skills will determine the design of your new hairline and how the hair will grow in creating a look that is natural. The hairline is generally considered to be the most important aspect of the entire head of hair. This is because it frames the face, and will change the appearance most dramatically. Giving a more youthful appearance. When designed well, your new hairline also bring self-confidence and a renewed feel-good factor. Hairline planning can be a compromise between the patient and the doctor. On occasions, people have a tendency to want the hairline too high or too low. This needs to be addressed for the long term look and well-being of the patient. The low rounded adolescent hairline will look fine on a younger man but not match the age and facial features of an older man. The younger man probably still has vivid memories of his original hairline. As a result, will generally want to create the same appearance. But, a more mature, or middle-aged man may fear that a hairline that is not adequately receded. That the temples may seem unnaturally low and inappropriate for the age. Temple point recreation and the flat look hairline need to be age appropriate. The apex or centre of the hairline is always the lowest point. All measurements must take this into consideration, as well as facial bone structure. When designing a new male hairline with minimal recession one has to understand the principles of the hair transplant. Hairline placement, density and thickness can vary from the ethnic origin and genetic background. It is not advisable to just follow a trend in hairlines. Instead, to mimic nature and your pre-existing makeup. It is often to recognise an individual´s origins, even if not directly, through their natural hairline placement. What may look perfectly natural for one´s bone structure may look inappropriate and unnatural for another. By respecting your natural bone structure will ensure your hairline, regardless high or low, flat or receded will look natural. Age, as mentioned can play a role in the hairline design. This, in balance with your current hairline position and future hair loss potential. As hair loss increases the total surface area to treat a plan is required to create a balanced head of hair. This is especially true when total hair coverage cannot be achieved. Over one or multiple hair transplant procedures. Your donor hair is a finite resource. Meaning it has limits, the hair does not rejuvenate. Predicting the ultimate hair loss pattern is impossible in the early stages, and at a young age. This long term planning from the first procedure is critical. With you and the doctor ensuring you are on the same page with the same goals. All patients want to achieve a result that is thick and natural. In reality, an individual´s insufficient donor hair can restrict the ability to accomplish this “ultimate result.” It is important to understand that it is not always possible to achieve the ultimate goal and sometimes a compromise has to be made. 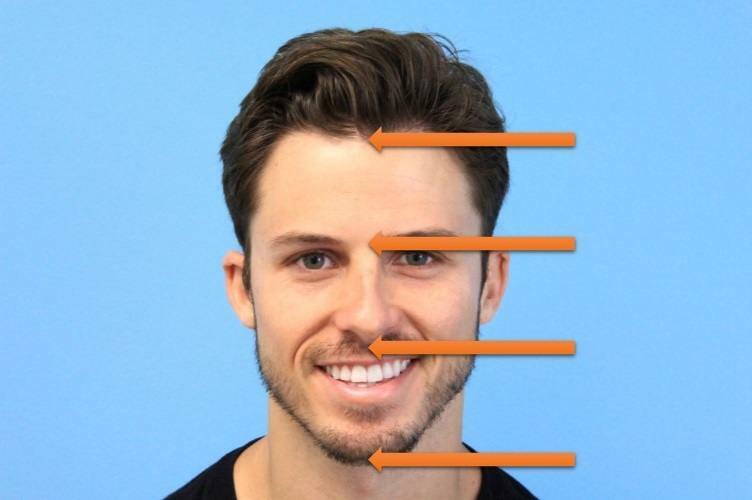 While assessing the candidate’s suitability for a hair transplant the doctor is studying such characteristics as personality, facial features and aspects such as the existing hairline. At this stage, the doctor is planning how they will place different groupings of hairs in different patterns to best fit that individual. Taking the time to analyse these details enhances the doctor´s ability to form an initial idea of his assessment and plan for your case. The best hairline design is personal and individual. Your natural hair characteristics in balance with your age, hair loss pattern today and in the future and your natural bone structure will determine your natural hairline design and position. Be prepared to compromise for the best long term result. As you mature so do your facial features. We maintain our basic look but features slightly mature as well. This applies to your hairline, even a man with a good head of hair their hairline will still mature. As a hair transplant is mimicking nature this must be considered in the design.